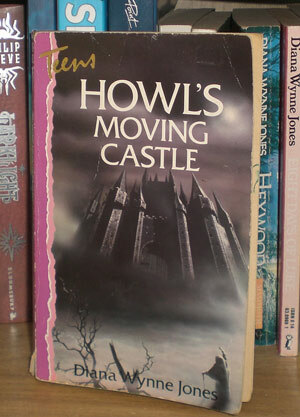 Howl’s Moving Castle – the Best Book in the World? There’s currently a Diana Wynne Jones celebration going on over on tumblr, fans posting quotes, pictures and personal memories of what she meant to them. She never seemed to make it as big as she deserved, and I don’t really understand why. But those of us who know her, love her. DWJ has long been one of my favourite authors, and of all her books there is no question but that Howl’s Moving Castle is my favourite. The review I wrote on Amazon (so long ago that I’ve changed email addresses and it’s no longer connected to me) describes it as ‘pitch perfect.’ Every word in the book is exactly the right one. In the land of Ingary, where such things as seven-league boots and cloaks of invisibility really exist, it is quite a misfortune to be born the eldest of three. Everyone knows you are the one who will fail first, and worst, if the three of you set out to seek your fortunes. Sophie Hatter was the eldest of three sisters. She was not even the child of a poor woodcutter, which might have given her some chance of success. You recognise instantly the world the story inhabits and yet, of course, the rules will be turned on their heads as the story progresses. In my opinion, DWJ’s greatest talent was not in writing magic (though she was excellent at that), but in writing characters. Her best characters are flawed, humane, funny, and so real you want to take them down the tea shop and have a natter over a pot of darjeeling and a nice scone. Sophie Hatter is shy and undemanding, expecting little from life. But being magically transformed into an old woman unexpectedly frees her to embrace life as she never did before. She becomes outspoken, bossy and very capable. Her own latent magical powers are delightfully unconventional; she talks sternly to inanimate objects and they obey her. Of course, Howl is the standout character in the book. Did DWJ know when she wrote him that she would break the hearts of schoolgirls (and grown women) around the world? I like to think that she did. Howl is foppish, cowardly, vain, selfish and irresponsible. He throws a mardy tantrum when his best suit is ruined, drenching the house in magical green slime. He virtually invents the concept of man flu. But of course, there is more to him than this. He is also utterly charming, and ultimately shows himself the hero we knew him to be deep down all along. Despite all the twisty-turny confusion, DWJ delivers it all with an unexpectedly light touch. She doesn’t waffle on about scenery or weather. She doesn’t allow her protagonists to wallow or mope, no matter how dire their circumstances. She doesn’t even use big words. But her prose is perfect: light and easy to read, and always with a warm undertone of good-natured humour. He tried to go upstairs through the broom cupboard, and then the yard. This seemed to puzzle him a little. But finally he discovered the stairs, all except the bottom one, and fell up them on his face. This light, easy, fun tone sounds so effortless, and is so hard to do well. I know. I’ve tried. More than any other author Diana Wynne Jones is who I try to emulate in my own writing (I called Darklands‘ protagonist Sophie as a tribute to Sophie Hatter). When I’m sunk in despondancy and lack of motivation, I’ll likely pick up Howl’s Moving Castle for a furtive little read; just to remind myself what I’m aiming for. * I’ve probably read it at least ten times. Agreed. I love this story. I must admit that I did come to after seeing the animated movie but both the movie and book hold different but equally special parts in my heart.